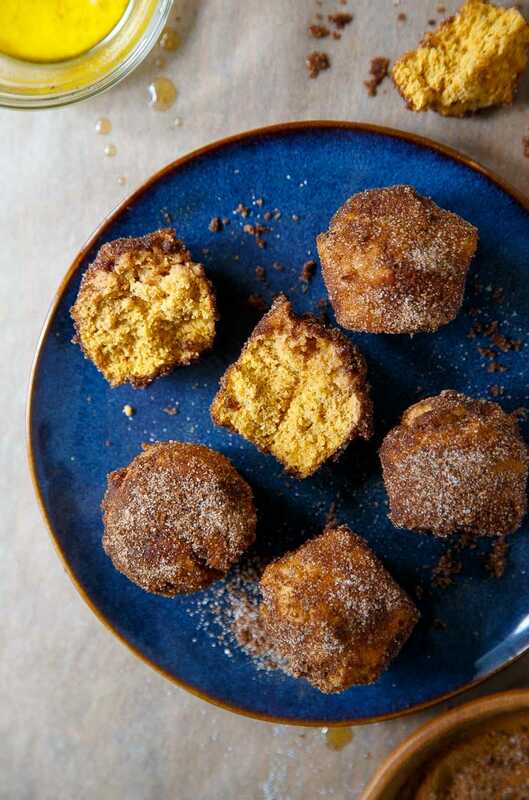 Hand to God, these baked donut holes taste like fried donut holes. I don’t know how I did it. There were several versions, but the last one just popped. I sent the recipe to my Mom to try, and she agreed. It’s not just the cinnamon-sugar coating (which all donuts should have, am I right? ); there’s a creaminess to the muffins. It’s unbelievable. Until you try it! I’m not one to shy away from frying anything (pickles?, ice cream?, veggies? 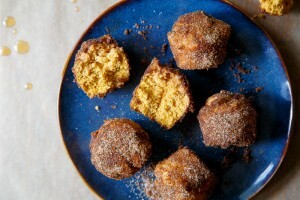 ), but in the interest of getting donuts in my face faster, a baked version can really save the day. I’m not even going to cloud up this recipe with 300 words on why you should make it. I’m just going to say ‘DO IT’ and trust that you will. You won’t regret it. Spray 9 cups in a mini muffin pan with cooking spray. In a medium bowl, beat together the softened butter and sugar until fluffy, about 2-3 minutes. Beat in the egg white and pumpkin puree. Add 1/3 of the dry ingredients to the wet, mixing just to combine. Add half of the milk, mix well. Add another 1/3 of the dry ingredients, stirring to combine, followed by the last 1/2 of the milk. Finally, stir in the the last of the dry ingredients. Divide the mixture into 9 of the mini muffin cups. Do not make more than 9 muffins--pile the dough into the pan evenly. Bake for 12-13 minutes, until a toothpick inserted comes out clean. Let the muffins cool in the pan while making the coating: melt the butter and place into a small bowl for dipping. 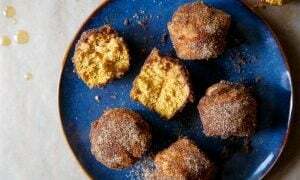 Stir the cinnamon and sugar together in a shallow bowl for dipping. Dip each muffin generously in butter, and then roll in the cinnamon-sugar mixture. Serve immediately, but will keep for 1 day covered on the counter. Yumness! Just when I thought a donut hole couldn’t get better you go and make these perfections! When are we baking these together? SMITTEN! Hurray for pumpkin season!! These look fantastic! I need no convincing. I trust you 100%. Totally in love. I would like 5, please. Ok fine, if you make me! Doing it. I might have to make these tonight….. I love me something baked that tastes like it’s fried. It’s a good thing this only makes 9 donut holes because I think I’m going to eat the entire batch myself. i love when pictures can talk for itself. i had been waiting for these. i have to JUST DO IT. I was just thinking about making donuts and these will be perfect. Thanks! unfortunately, canned pumpkin puree is not available anywhere near where I live. Can i replace it with like boiled and pureed squash instead? or applesauce?